My latest video is a tutorial on how to simulate a cast metal texture on plastic models. Many tanks such as the Soviet T-34 or the American Sherman had sections of armor that were made of cast metel, rather than rolled sheet metal. Usually it was for gun mantlets or tank turrets, areas that needed to be curved which plates of metal couldn't do. Many modern scale model kits do a good job of simulating this distinctive cast metal texture in 1/35 scale - Dragon, Meng, modern Tamiya kits all do this well. But a lot of older kits do an abysmal job, or don't even try. Replicating a cast metal texture in scale is quite easy, and it really does add something to your model. I use Mr Surfacer 500, available from any hobby shop or easily found online. There are other methods, such as using glue to partially melt the surface, but I have found these a bit tricky and unpredictable, and it is a rather anxious process to see your carefully built model looking gloopy and partially melted! Mr Surfacer is sure fire - you literally cannot mess it up as long as you keep the texture to the correct area and don't "colour outside the lines". And it only takes about 15 minutes. Good luck, and enjoy experimenting! 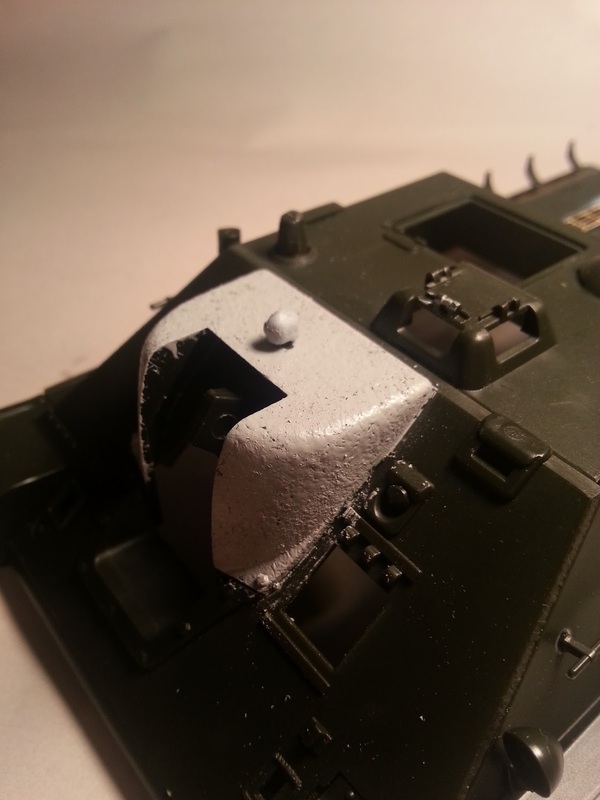 Cast metal texture on this big, ugly Soviet gun mantlet, using Mr Surfacer 500.